Belooru ([beːluːru] (Kannada: ಬೇಲೂರು ) is a Town Municipal Council and taluka in Hassan district in the state of Karnataka, India. The town is renowned for its Chennakeshava Temple, one of the finest examples of Hoysala workmanship. The main attraction in Belur is the Chennakeshava temple complex which contains the Chennakeshava Temple (dedicated to Chennakeshava, meaning handsome Vishnu) as the centerpiece, surrounded by the Kappe Chennigaraya temple built by Shantaladevi, queen of king Vishnuvardhana. 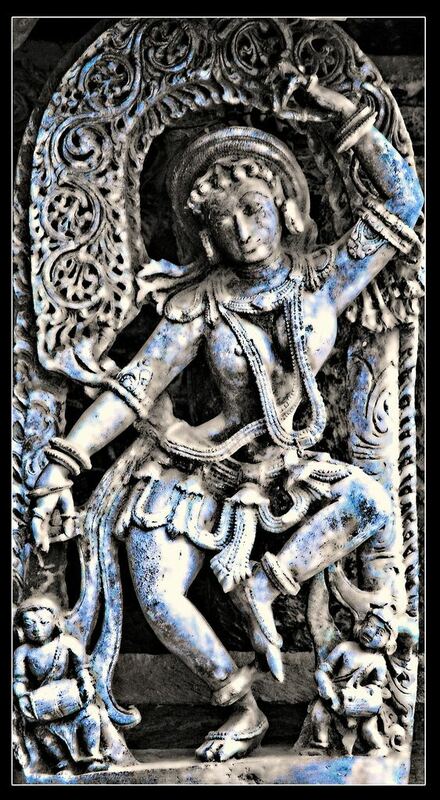 It is said that Shantaladevi herself danced in front of the main shrine during its installation and her dance inspired the poses of the figurines on the temple walls. There are two more shrines here that are still in use by devotees and there is a Pushkarni or stepped well to the right side of the main entrance. The Dravida style rayagopura at the entrance which was a later addition by the Vijayanagar kings, who considered this deity as one of their Kuladevata or family god. The temple is one of the finest examples of Hoysala architecture. 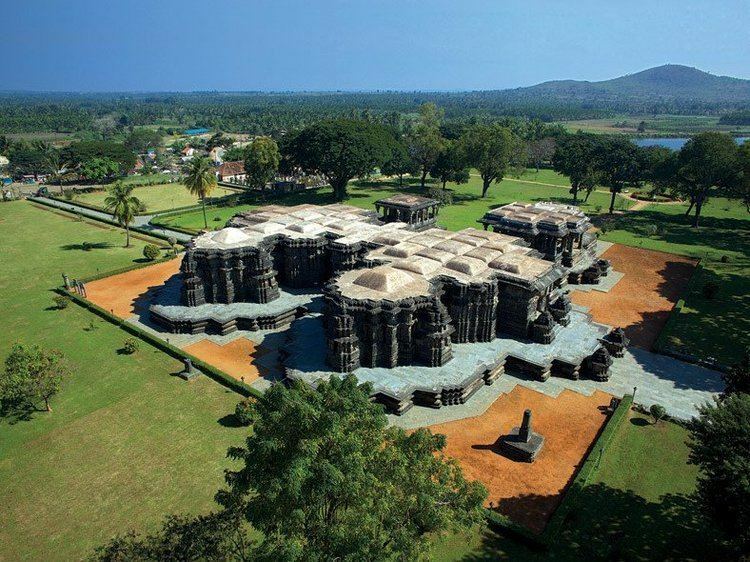 It was built by king Vishnuvardhana in commemoration of his victory over the Cholas at Talakad in 1117 CE. Legend has it that it took 103 years to complete and Vishnuvardhana's grandson Veera Ballala II completed the task. The facade of the temple is filled with intricate sculptures and friezes with no portion left blank. The intricate workmanship includes elephants, lions, horses, episodes from the Indian mythological epics, and sensuous dancers (Shilabalikas). Inside the temple are a number of ornate pillars. 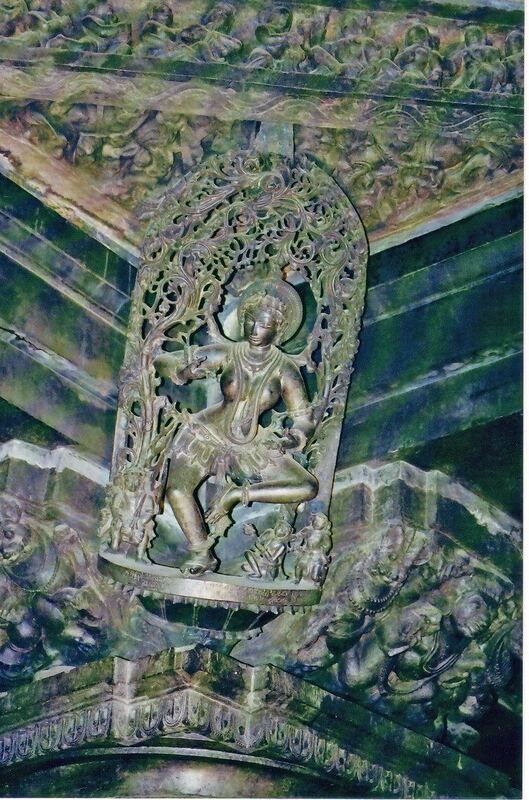 Darpana Sundari (Lady with the mirror) carved on walls of Belur Temple is one of major attractions in the complex. This temple along with Hoysaleshwara Temple in Halebidu and the Jaina monuments at Shravanabelagola are being proposed as UNESCO world heritage sites. By road: Regular buses ply from Bengaluru (222 km), Chikmagalur (22 km), Halebidu (16 km), Kadur (62 km), Hassan (32 km), Hospet (330 km), Mangalore (124 km), Mysore (149 km) to Belur. Nearest Railway: Chikmagalur (22 km), Hassan (about 32 km from Belur), Banavara and Arasikere are also near Belur. Nearest Airport: BIAL, Bengaluru about 222 km from Belur. Mangalore International Airport about 130 km. The primary mode of employment in the Belur region is agriculture. Crops grown include coffee, rice, finger millet, pepper, cardamom, ginger and sugarcane with paddy being dominant. Belur: Home to the Hoysala temple complex. The Chennakeshava temple here was completed in 1116 by Hoysala Vishnuvardhana. The temple is 37 meters tall and is standing on a platform which has exquisite art work on its outer walls and bracket figures of dancing girls in various poses in perfect proportion. There are shrines of Kappe Chenniga Andal, Sowmya Nayaki etc. The temple here is a classic example of Hoysala art, and Belur was one of the Hoysala Capitals. Halebidu: It is 16 km from Belur, was capital of Hoysala and it was formerly called as Dwarasamudra. It has one of the finest Hoysala temples said to have been started by Ketamalla, a commander of Vishnuvardhana in 1121. The twin Shiva Temples with a common platform and two garbhagrihas, one houses for Vishnuvardhana Hoysaleshwara Linga and the other for Shanthaleshwara Linga. In front of Hoysaleshwara is the Nandimantapa and behind that is shrine of Surya with a two-meter-tall image. Outer walls have rows of intricate figures narrating episodes from epics like Ramayana, Mahabharata, and Bhagavata. Hoyasalas – “Hoysala” meaning “Strike Sala”. Guru Sudatta Muni, a Jain saint said to his student, Sala who was in combat with a tiger. The duo were performing rituals at the Jain Temple in a village called Sasakapura or Sosevur. The tiger attacked them, Sala struck the animal with one blow, and both were immortal. Sala became the first ruler and founder of the Hoysala dynasty. This incident was so patronised and it became the emblem of the Hoysala. The Cholas were defeated by the Hoysalas. The temple of Vasantha Parameshwari lies in ruins. Journey of the Hoysalas begins 1000 years ago, they were not born rulers and still they went on to rule for 300 years. They were tribal chiefs who subordinates of the Western Chalukyas. Studies show that they were descendants of Yadava clan, some indicates that they were from Male (hills) natives of Malnad. Arekalla, (in 950), Maruga and Nripa Kama I (in 976) are some of the kings from Hoysala. Ones who really shaped the history are King Vishnuvardhana and Veera Ballalla. King Vishnuvardhana is famous for his patronage to arts along with their exploits on the battlefield. 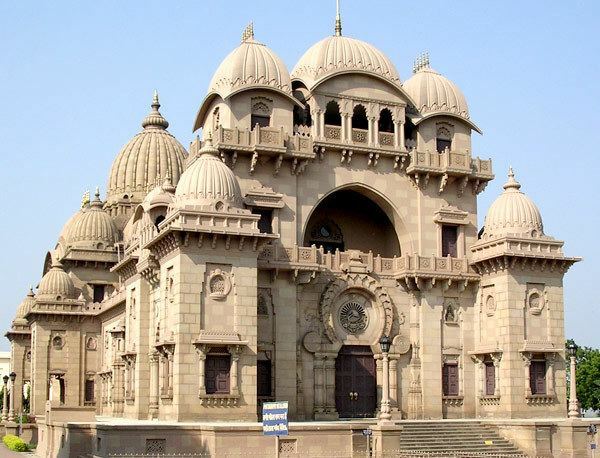 The famous Belur and Halebid Temples were built by him. During his reign a baffling 1500 temples were built in 958 locations out of which only 100 survive today. Vishnuvardhana was also known as “Bittideva”. He was a Jain who became a Hindu following the preachings of Ramanuja. His queen Shantaladevi continued to patronize Jainism. The Chennakesava temple is important among the temples of Belur. One can find the inscriptions in the ruins of Angadi. The temple is being restored amidst verdant green plantations. The Archaeological Survey of Indian has taken up the restoration of the broken pillars, strewn inscriptions and defigured idols. However, there are several temples tucked away in small hamlets, some of them are Kedareshwara, Doddagaddavalli, Marle, Mosale, Nuggehalli, Hosaholalu, Somanathapura, Talakadu, Arasikere, Tarikere, Belavadi, Javagal. Along with the temples are the Basadis. In Tumkur district, Kaidala is the birthplace of the sculptor Jakanacharya who built the temple in Bellur. The Chennakeshava Temple is a holy house for sculptures showcasing innumerable variety of ornaments, the doorways, the ceilings, the birds, the animals, dancers and other figures are fully decorated as if they are full of life and vigour with variety of actions and movements. The doorways are guarded on either side by the gorgeously decorated dwarapalaka (doorkeepers). There are two more shrines here that are still in use by devotees and there is a Pushkarni or stepped well to the right side of the main entrance. The temple is one of the finest examples of Hoysala architecture. The facade of the temple is filled with intricate sculptures and friezes with no portion left blank. The main entrance is crowned by a Rayagopura built during the days of Vijayanagar empire. Within the temple complex, the Chennakesava temple is in the centre, facing east and flanked by Kappe Chennigaraya temple and a small Lakshmi temple on its right. At Chennakeshava temple daily pujas are performed. An interesting sight within the sanctum are the ancient jet-black Hoysala pillars, covered with bright vermilion smeared on by devotees. The main temple is surrounded by Temples of Soumyanayaki and Ranganayaki, beloveds of Sri Chennakeshava. Stories from the Puranas, Upanishads and other mythological stories have been carved in the most authentic way. The Ramayana and the Mahabharata also have been included .The bracketed figurines called the Madanikas or celestial nymphs are no doubt the highlight of the temple's magnificent architecture. The Madanikas are said to be inspired by the beautiful Queen Shantaladevi, epitomizing the ideal feminine form. There are about 48 pillars of various sizes, shapes and designs, bearing testimony to remarkable artistry. The main highlight of the temple is Darpana Sundari or "The lady with the mirror". Inside, even in the darkness, you can see the shining pillars, each unique in its own splendor. The most popular being, the Narasimha pillar in the Navaranga, unique in its filigreed splendor. It is said to have revolved on its ball bearings once. Shantaladevi, a dance legend herself, built a temple in similar fashion to the main temple, which was called the Chennigaraya temple. The entire structure with its intricate Filigree gleams like metal. Chloritic Schist, a light greenish soapstone, hard as granite was used to create the complex. 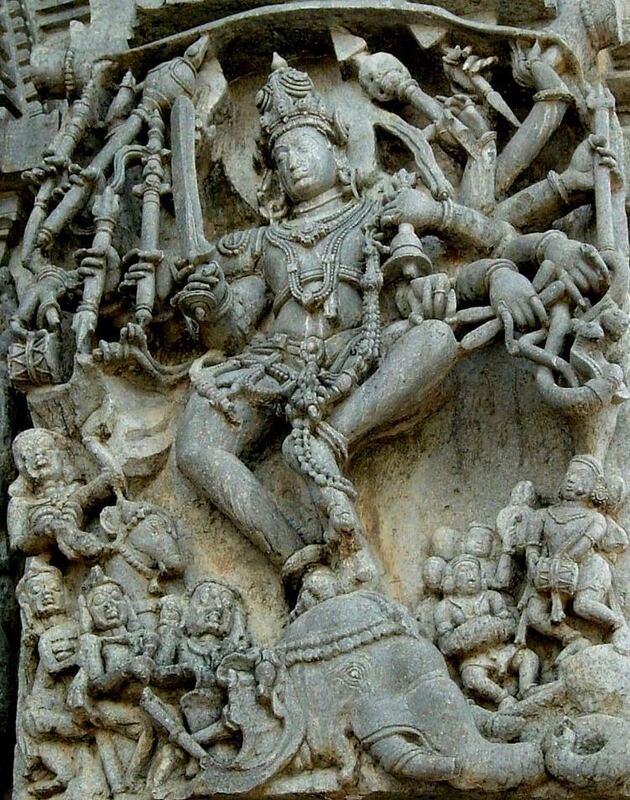 Hoysala sculptors have broken this custom and signed their sculptures. They engraved their names, titles and even the place of their origin at the foot of their art work. Mallitamma was the most prolific of all known Hoysala artists and more than forty well-executed sculptures stand in his name. However, even after a lapse of eight centuries, the art lovers of the whole world can adore this heritage centre. The Temple is not in a good shape still, you could spend hours studying the minute carvings on the exterior. The temple has lost its superstructure but looks very imposing. Belur is located at 13.17°N 75.87°E﻿ / 13.17; 75.87. It has an average elevation of 962 metres (3156 feet).